To tabloid filled US audiences, Australia’s billionaire and casino mogul, James Packer, has tended to be associated more with having a hand on Maria Carey’s voluptuousness than decent deals and sound business prowess. Last year’s gossip columns were dripping with prurience at the antics of a person who seemed a shadow of his ruthless father, the same daddy who created World Series Cricket and a casino empire. Luscious, bouncy Mariah subsequently made an enormous splash by demanding $50 million as compensation for having to move her life from New York to LA, leaving the sores open about his general association with music and Hollywood glitterati. To add some kindling to the fire, Carey threw some meat to the media wolves: “Mariah Carey and James Packer had a fight in Greece. They have not seen each other since.” The games the rich and powerful play. A seasoned gambler prides himself on bountiful resilience, the near elastic ability to absorb the punches of rude fate while being able to challenge the house. Self-control kicks in to prevent a giddy head, keeping extravagance in check. Steady deals are preferred over outrageous ones. To not follow these steps is to doom the gambler to a Dostoyevskian disaster tale, a slide into atrophy. This can unfold on the roulette table, a point that affects the protagonist, Alexei Ivanovich, but also in other forms, such as running up debts, as does the Russian family he is tutor to in Germany, gambling on the death of the family matriarch and her inheritance. In time, the matriarch, based in Russia, visits her family, and squanders her own assets in the casino. The wheel truly turns. Packer’s venture into the Hollywood empire, typified by the Ratpac experiment, did have the Dostoyevskian element of decay about it, without, admittedly, the dark poetic reflection. It was the greatest hand to play, one that would etch his name in blinding glitz and hideously fun glamour. He wanted a hand in the dream factory, a funding contribution to content and experiment. What ensued in the Ratner-Packer relationship are celluloid moments, snapped glories where Hollywood actors and directors come together, where the attention seeking gambler meets his heroes (Robert De Niro, Martin Scorcese, Brad Pitt), keeping company with his camera pampered icons. This is candy for the press, fodder for the dream factory. In what amounts to the fascination of a blushing child crush, Packer would claim that they had become his friends, albeit the sort mediated by ample cash. The Ratpac institution itself has had a range of products of variable success. (The term variable is used advisedly.) 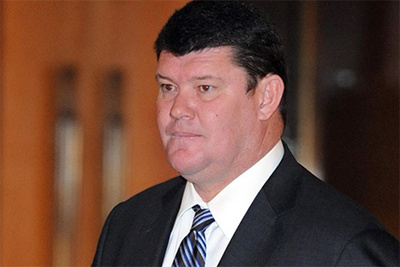 These suggest that Packer may not have been entirely up his shallow brown creek without a paddle, though his former partner, Ratner, refuses to reveal too much of the role played by the casino tycoon. The Ratpac did have a hand in such landscape rich experiments as The Revenant, supplying Leonardo di Caprio with a successful stab at an academic award. Yes, it was the directing flair of Alejandro González Iñárritu who did pull it off, but behind experiments of culture, notably those in the cinematic kingdom, come buccaneering patrons, the willing sponsors, the cash reserve. It had even been suggested that Packer’s pockets, deep as they are, were not sufficient for the rapacious death-star that is Hollywood. The Ratpac, in the tradition of good risk, also managed to fund a set of mind slushy wonders (Storks, Jupiter Ascending, Entourage, to name but a few), showing how the odds in Hollywood are probably worse than they are in the permutation sets of Las Vegas. Poor taste, demand and risk tend, to be a profane triad, operating without mercy. Unfortunately for Packer, his own casino consortium, which he attempted to co-opt Hollywood into reflecting, attracted the salivating keen attention of Chinese authorities, largely through his association with Lawrence Ho’s Melco in Macau. Eighteen Crown Casino personnel were rounded up in October last year on suspicion of “gambling-related crimes”, notably connected with the high rolling end of town. Not only was Packer wishing to get under Hollywood’s silk cover; he wished to brave, or at the very least sidestep, various gaming regulations by cultivating sites in Macau, a true money Mecca that dwarfs those on the Vegas strip. This was another gamble that did not pay off, failing to take into account the murmurs of reform moving through Chinese President Xi Jinping’s anti-corruption strategy and focus on capital outflows. Now, relative humbleness, born from punishment, has returned. Tail tucked between running legs, the Ratpac investor has gone back to his traditional brat roots, watered by Daddy’s money, drip-fed broken dreams of vast global ventures of the spirit, flesh and the wallet. Sydney Crown 2020 is keeping him busy. Stabilising investments, and righting the budget, are current preoccupations. Packer prefers to stay focused on what he knows best, and, arguably, the only thing he has ever known: the soul sucking lure of gambling, and the lingering, caged air security of the casino.